This hilarious and dramatic point-and-click adventure deserves its’ day in court. Far removed from its glory days in the early 1990s, point-and-click adventure games have been staging a minor comeback on the Nintendo DS. 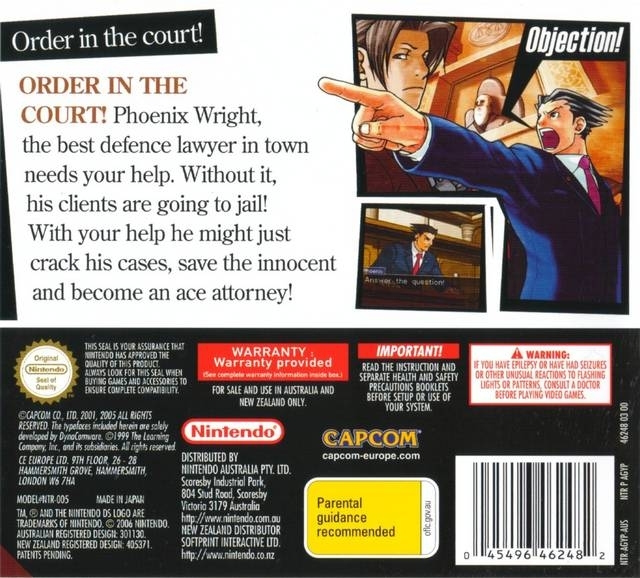 Capcom’s Ace Attorney franchise has been at the forefront of this advancement. 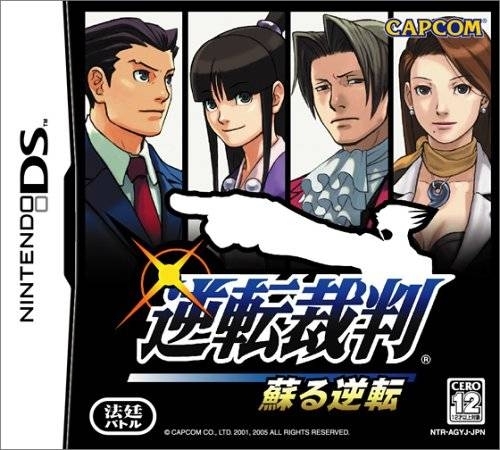 Placing players in the suit and anime-appropriate spiky hair of up-and-coming defense attorney Phoenix Wright, the game has the player search through crime scenes for evidence, meet with their client and other witnesses, and build up their case for the intense court battle to come. There are two main styles of play in Ace Attorney. Typically, when you begin one of the five cases, you’ll start by going to the Detention Center to talk to your client, who has inevitably been accused of a murder they did not commit. Thus begins the investigation stage. In this stage, you’ll be poking around various environments, pointing at things of interest with your stylus, and engaging in story-advancing dialogue trees with witnesses, police and even the prosecution. Sometimes, in order to get someone to talk, you’ll need to present them with a piece of evidence you’ve collected. Be sure to get a feel for these people when you talk to them, as most inevitably turn up in court the next day as witnesses. Also, players needn’t worry about missing crucial evidence, as the game will not proceed until you’ve collected everything you need. Truth be told, aside from the exposition, these sections are fairly vanilla image-searching games, and most will likely try to get them over with as soon as possible in order to get to the next well-worth-it courtroom scene. The trial phase is the real meat and potatoes to this series. By far the longest portions and most enjoyable parts of the game, you are tasked with scrutinizing witness testimony and finding contradictions. Scroll to the line of dialogue you find fishy, and you’ll have two options. You can either ‘press’ the statement, asking a question to get more information, or ‘present’ evidence. Be warned, though — it is absolutely not advisable when you’re stuck to present every available piece of evidence at every statement. 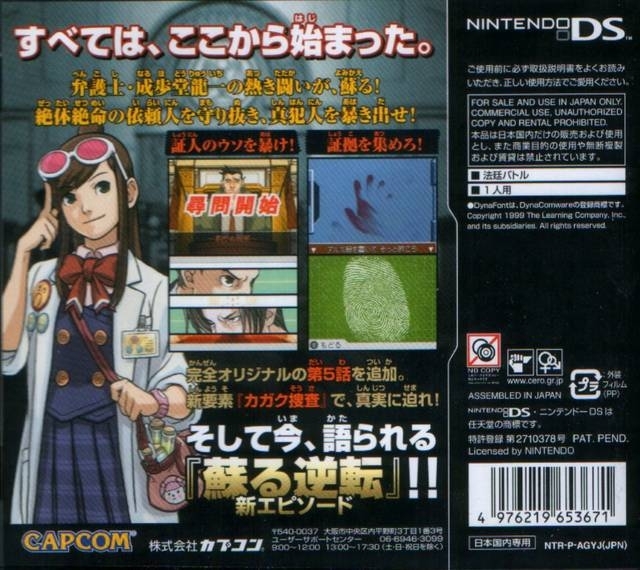 The game employs a quasi-health system, whereby whenever Phoenix makes a mistake with evidence, he gets a ‘penalty’. Five penalties in any given trial phase means a guilty verdict is declared, and the game is over. Fortunately, you can save at any time, but there’s no room for error as there is only one save slot. 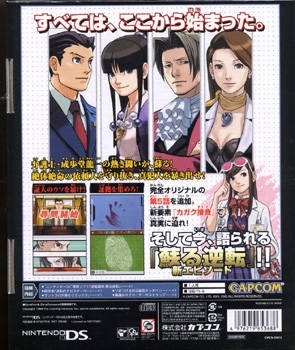 The odd similarities between Ace Attorney and a typical one-on-one fighting game don’t end with the health system. Each trial is set up like a battle between the defense and the prosecution - mostly because the judge is completely incompetent. 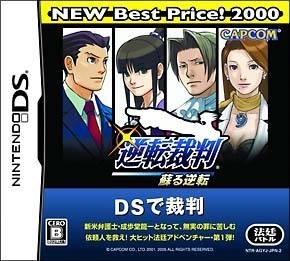 From the taunt-like stares between Phoenix and prosecutor Miles Edgeworth before each testimony, to the visible suffering and pain they seem to go through when ‘attacked’ by decisive evidence, this rivalry between the two lawyers permeates the proceedings and gives each trial a personal touch. 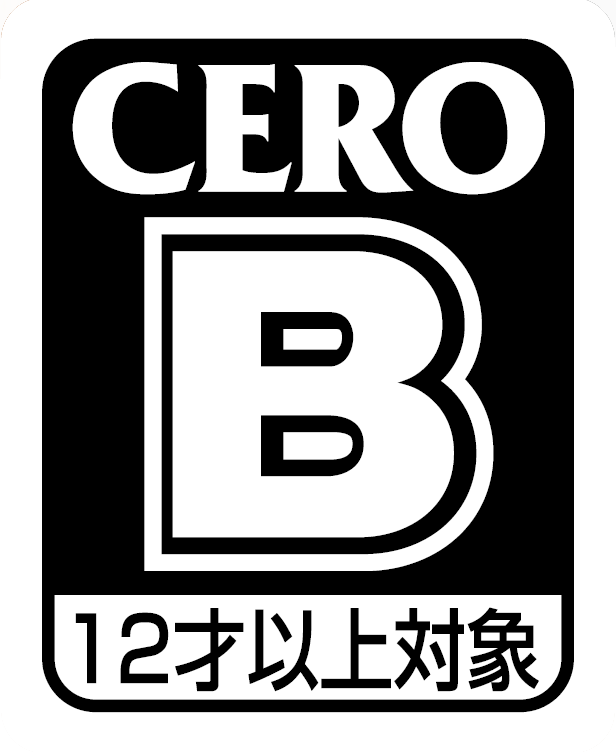 There are even moments where, after a difficult testimony, Capcom clearly gets the player to present a long string of obvious evidence, dealing a long combo of ‘blows’ to your opponent (again, similar to a fighting game). 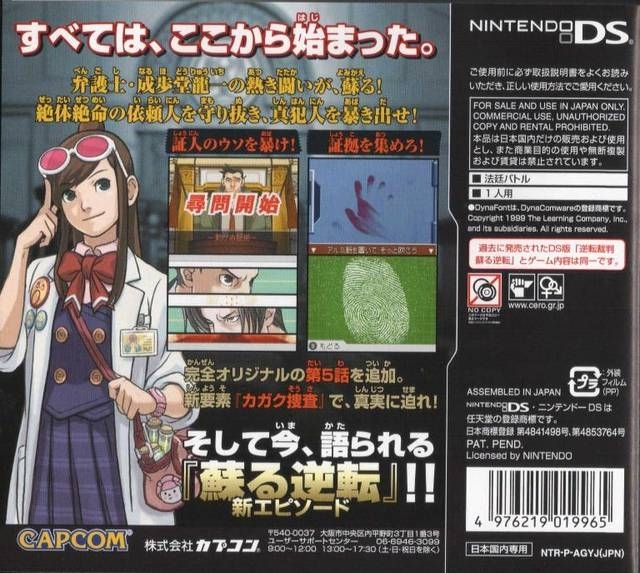 The visuals in Ace Attorney are the most obvious indicator that Capcom meant for this to basically be a playable anime. From Phoenix’s hair, which is so spiky that it should be classified as a deadly weapon, to the highly exaggerated facial expressions and body movements, everything is so over-the-top outrageous that you’re sure to be drawn in. Characters all have detailed animations for 'happy', 'sad', 'angry', 'surprised', and 'confused'. It’s hard to forget the disproportionately huge finger that Phoenix points when he’s found a flaw in testimony. Unfortunately, Capcom wasn’t able to animate every single action the characters would be performing, which can take away from the experience somewhat. For instance, if you present a book as evidence, Phoenix may say “Look at this book,” while he’s clearly tapping a piece of paper. 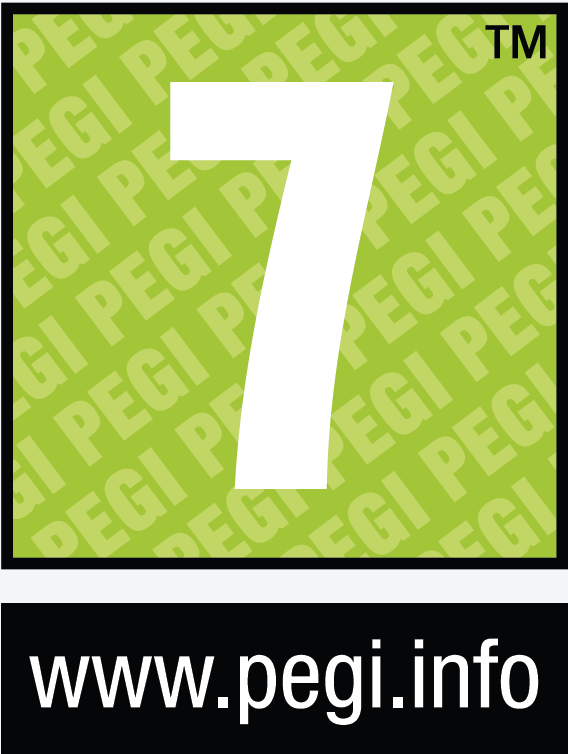 The book would simply appear as an icon in the corner of the screen. It’s understandable that Capcom couldn’t possibly make individual animations for the hundreds of evidence pieces, but it does affect the experience just a bit. Unfortunately, while the characters are nicely animated, the backgrounds in the game are rather bland. Yes, there might be all sorts of things going on, theoretically, but you don’t see any of it against this static background. Phoenix will simply say, “Police are running around wildly,” or something of the sort. There is no animation to the background at all, and even when you take an item as evidence, it’s still clearly visible in the scene. Characters you can speak to simply appear in front of the background. Every once in a while, like when watching parts of the murder play out during a case’s prologue, some highly detailed pictures of an emotional scene will break up the monotony of these settings. Sound is one area where this game knocks it out of the park, especially in the music. From the quizzical tone that plays during a testimony to the short pause followed by highly energetic beats after you present conclusive evidence, the music really communicates the tone of the present situation well. Outside of court, most characters also have a distinctive theme that plays whenever they’re around, making it easy to identify them. The sound effects are very well-done, too. 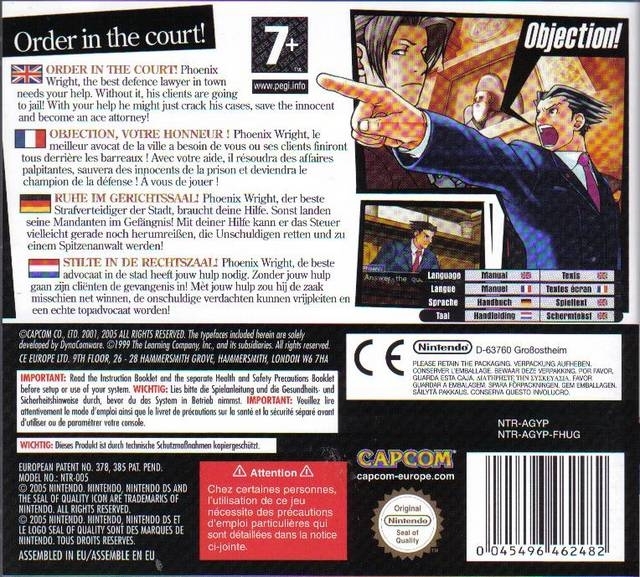 Phoenix’s loud shouts of “OBJECTION!” have already become an internet meme. 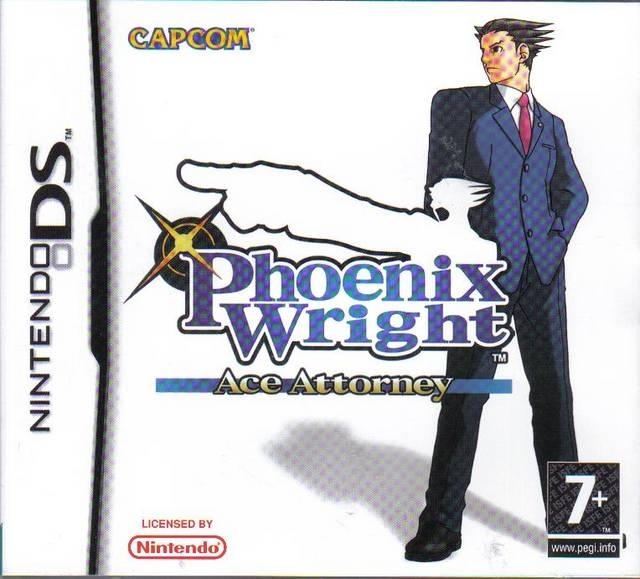 The minimal voice acting used when Phoenix finds a contradiction, or by the prosecution when they're trying to stop him up, really gives the player a sense of the attitude each one takes. Without spoiling anything, just the voice of the prosecution from the final case (not including the bonus case) makes me cringe--in a good way! The exaggerated actions of the characters are well-represented here too, such as the earthquake that occurs when lawyers on either side slam their hands on their desks. As the story is paramount in an adventure game such as this, I’ll avoid major spoilers in this review. That said, many classic anime conventions are here in full force. Good-hearted protagonist willing to defend anyone he likes to the death? Check. Lovably dimwitted female sidekick? Check. Spirit of your former mentor showing up to help you just when things look their direst? You bet. Ruthless rival with a troubled past who may not be as cold-hearted as he seems? Present and accounted for. That said, the characters are so enthusiastic, and the dialogue so well-done, that you’ll really want to find the next piece of evidence or object to the right part of a testimony, just to find out a little more about how it all plays out. You’ll hate the characters you’re supposed to hate, laugh at the comedic people, and really get a feel for what Phoenix would be feeling at the moment. As the game wears on and the trials become more personal to Phoenix and Edgeworth, the tension that each revelation brings to the proceedings is palpable. Ace Attorney has some of the best (read: most hilarious) writing in the industry. From references to popular media (“It’s only a flesh wound, Mr. Wright!”) to self-referential humour and some serious cracking of the fourth wall, this game is seriously funny. The dim-witted police officer you work with through much of the game, Detective Gumshoe (yes, that means ‘Detective Detective’), has the odd quirk of calling everyone he speaks to "pal". So, of course, when your assistant, Maya Fey, uses this term, he gets furious and says, “Hey! You can’t just going around calling people ‘pal’! That’s MY endearing character trait!” Moments like these, such as the judge asking a hotel bellboy why he’s brought his tea-tray to court (a reference to the fact that the characters use the same sprites on trial and outside), are strategically-placed to take the edge off of tense situations, and are some of the most memorable parts of the game. Controls in the game are so elegant that everything else in the genre should take a hint — this is what the DS was designed for. The entire game can be controlled exclusively via buttons or via the touch screen, or players can use a combination of both. Possible actions, such as ‘Present’, ‘Press’, and ‘Talk’ are displayed on the bottom screen. Simply touch the intended item or scroll over to it and press ‘A’. Unlike some games that can be controlled via either method, like Super Mario 64 DS, the player does not have to double-tap the touch-screen in Ace Attorney to switch control methods — it’s very fluid, and I often used elements of both in quick succession without even noticing it. 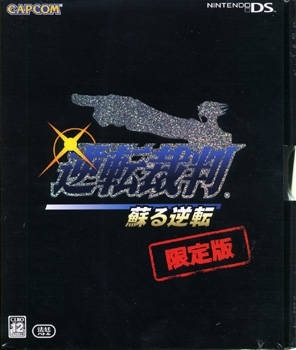 Capcom also included microphone functionality, allowing the player to verbally shout the “HOLD IT,” or, “OBJECTION!” at the appropriate moments in lieu of touching the corresponding button. True, it’s possible to simply cough into the mike to get the same effect, but where’s the fun in that? 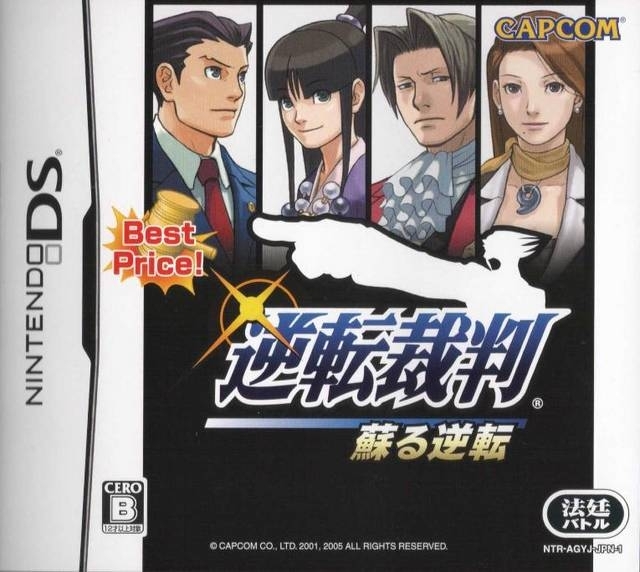 It’s difficult to judge the value of a game such as Phoenix Wright: Ace Attorney. While it’s a fairly lengthy game, with the cases lasting an average of four to five hours the first time through, there really isn’t much to do once you finish. 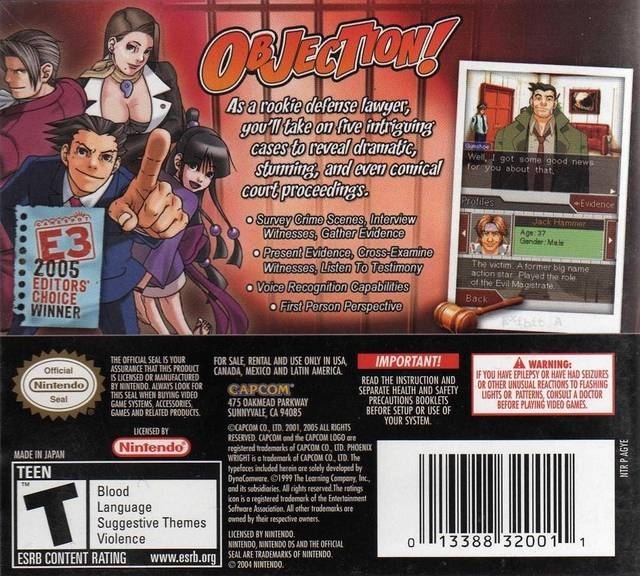 There are no collectables to speak of, no rewards for completing the game without a penalty, and no scoreboards for keeping track of how long it takes to finish a case. Definitely not a game that most will finish and then immediately restart for another go-around. 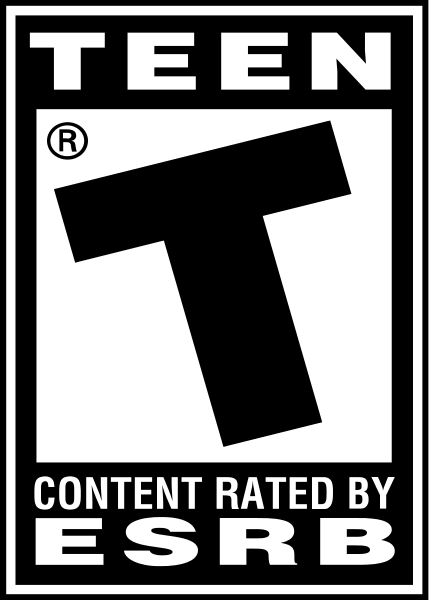 However, its universe is so incredibly engrossing that most will likely get the urge to replay it every couple of months. Basically, if you are the type to re-watch a season of your favourite anime series, you’ll be replaying Ace Attorney at least once without a doubt. 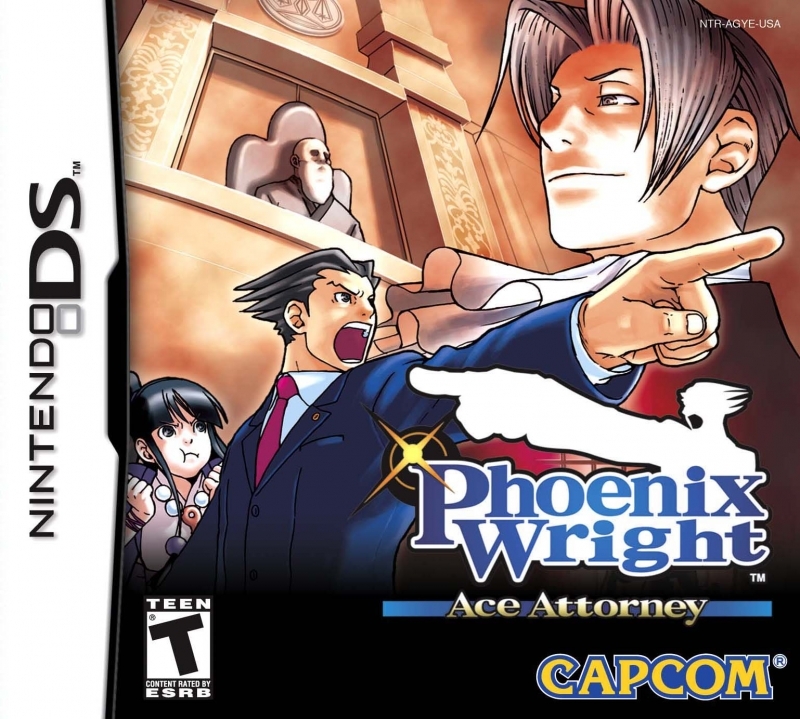 All in all, adventure gamers, anime fans and just people who like a good story will have a ball with Phoenix Wright: Ace Attorney. There are little annoyances, such as having to pixel-hunt through backgrounds to find evidence, but they are greatly overshadowed by the fantastic writing, great animation and sound, and the genuine “Oh, my god! That’s it!” feeling the player gets after finding a particularly elusive contradiction. 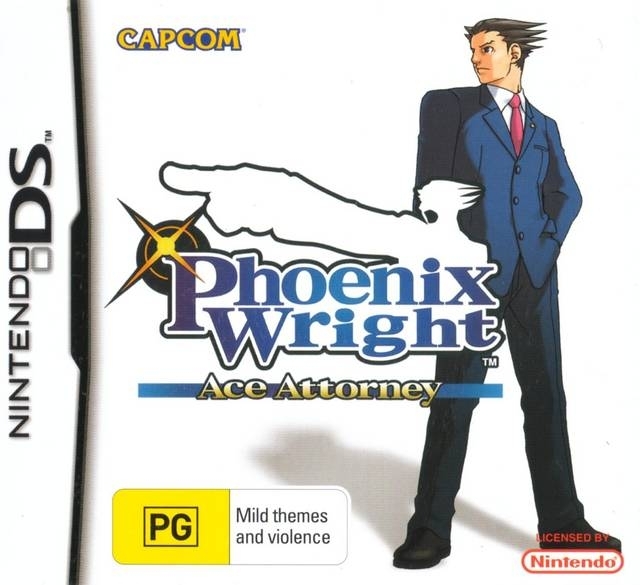 This game should in no way be used as a training guide for prospective lawyers, as it takes some ridiculous liberties with the legal system, but if you’re looking for a lawyer, Phoenix Wright is your man.